Check out all these moderate Iranians! TEHRAN (Reuters) – Thousands of Iranians chanted “Death to America” and vowed not to yield to U.S. pressure over Iran’s nuclear program at a demonstration on Sunday marking the 28th anniversary of the seizure of the American embassy. 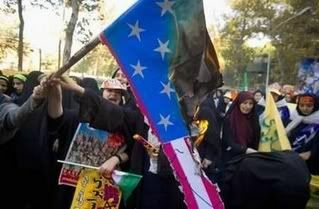 Students burned the Stars and Stripes outside the leafy compound in downtown Tehran that once housed the U.S. mission stormed by radical students on November 4, 1979, almost 10 months after the U.S.-backed shah left into exile. “The crowd shows that pressures from abroad cannot weaken our national will and Islamic unity,” said Abdollah Salehi, a 22-year-old Tehran University student. OK, that last part is not quite a Dem talking point, as they believe that sanctions, and talking to these Iranian nutjobs, will solve the problem. Along with some good old fashioned Chamberlain style appeasement. But the anti-American chants and burning of our Flag is remarkably like a liberal protest march, eh? “We came here to show America that it cannot do a damn thing and the Iranian nation will destroy them if they invade our country,” said Mostafa Jafarizadeh, 16. Bahman, 14, playing on the sidelines of the crowd with some schoolmates, said he had been brought by this teachers. Amazing. The US and Iran have something in common. Our teachers hate the USA and work to indoctrinate our children the same way Iranian teachers do. Watching the news this morning, and seeing the pictures at the Yahoo News story, there are lots and lots of children being indoctrinated into the Islamic extremist viewpoint. Some of the student leaders who took over the U.S. embassy are now among Iran’s most liberal pro-reform politicians. Say what? By al-Reuters definition, Castro, Mao, Pol Pot, and Stalin were “liberal pro-reform politicians,” too. Well, they all do hate the USA, want(ed) to see her destroyed, or at least massively changed, think America is the bad guy at all turns, and believe in the power of the state over the individual. I think I saw that same poster from the September 27th ANSWER demonstrations. 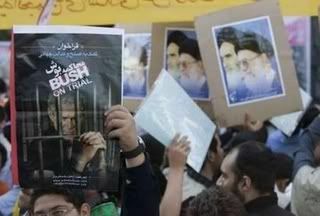 It is interesting how, if you check many of the al-Reuters photos, they had lots of English language posters and banners. It’s like they were doing it on purpose for English Moonbat speaking liberals. Fortunately for Iran, our liberals will throw their anti-nuke rhetoric out the window when it comes to Iran seemingly wanting to get The Bomb.